SAN FRANCISCO — Pottery Barn’s parent company in San Francisco has removed two Halloween costumes from its website after an Asian American civil rights organization charged that they were culturally insensitive. 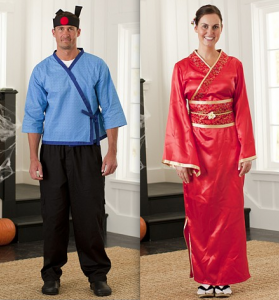 Pottery Barn pulled its sushi chef and kimono costumes after complaints of cultural insensitivity. A sushi chef costume and kimono for adults were created to coordinate with existing sushi-themed costumes for children. “Asian Americans Advancing Justice, the national affiliation of Asian American and Pacific Islander civil rights organizations, is writing to demand the immediate removal of Pottery Barn Kids’ ‘Sushi Chef’ and ‘Kimono’ costumes and that Pottery Barn issue an apology for marketing and profiting from offensive merchandise. “We were surprised, quite frankly, to see these costumes being sold by a national retailer based in San Francisco, a progressive city where more than one-third of residents are of Asian American descent. “While we don’t find the ‘Baby Sushi’ costume offensive, given that it clearly represents food, we do take issue with the ‘Sushi Chef’ costume, which is composed of ostensibly traditional Japanese attire and a Japanese-flag bandana, and the ‘Kimono’ costume, which is nothing more than a Japanese kimono. “Like other minorities, Asian Americans and Pacific Islanders are real people who cannot and should not be commodified as Halloween costumes. There is a history in this country of using caricatures to reinforce stereotypes of minorities as perpetual foreigners who are somehow less ‘American’ than white Americans. 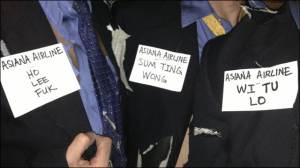 Asian Americans Advancing Justice has affiliates in San Francisco, Los Angeles, Chicago and Washington, D.C.
Three men wore Asiana-themed costumes with prank names from a KTVU broadcast. Those names were broadcast by KTVU-TV in Oakland in the belief that they were the names of the Asiana flight crew. The names turned out to be a prank, and KTVU was roundly criticized by the Asian American Journalists Association for failing to recognize that they were phony. The photo, which has been circulated widely on the Internet, was taken over the weekend at the Sidetrack Video Bar in Chicago. There are unconfirmed reports that the men are actual flight attendants for Continental/United Airlines, and United said in a statement that it is reviewing the matter. Another photo posted by the San Francisco-based SFist website shows a man wearing a torn and bloody uniform with the same three fake names printed on it. The photo was taken over the weekend at a party at Montbleu Casino and Resort in Lake Tahoe.